The new concentrated format appeared to attract more players to this gracefully aging and well supported event. 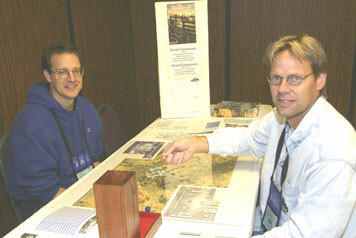 Designer Ed Beach (left) gave it his all but couldn't prevent Chris Withers' 8th straight title in the Great Campaigns event. In this year's tournament we had a slight change to the format to fit within the WBC tournament guidelines. We played six straight preliminary rounds on Wednesday and Thursday with a mix of scenarios from On To Richmond and Grant Takes Command. We had a total of 22 commanders participate. This included about ten newcomers or long ago players showing up at the Demo round with many of them playing several rounds in the tournament. After two days of battles (34 games played), we had one player at 5-1 and three others at 4-2 to advance to the semi-final round. During the preliminary rounds one very interesting situation occurred in a Sheridan Rides South scenario. Sheridan (Jay Myers) gave up on burning any significant number of railroad stations and headed straight into Richmond, bashing forts and scoring for brigades around the city. However, Stuart (Ed Beach) came in and totally surrounded Sheridan in Richmond forcing him to fight his way out. In the end, Sheridan did not completely escape. The semi-finals featured the usual suspects with Chris Withers against Steve Likevich and Ed Beach against Rob Doane in Retreat to the James. Chris and Ed advanced to the Final at Bloody Spotsylvania. Grant (Ed Beach) got good movement to start off, but then Lee (Chris Withers) had a string of initiatives and got control of Spotsylvania Court House. Grant did have his opportunities, but Chris' patented "positive combat dice rolls" strategy worked again with the Union Army taking horrendous casualties in four failed attempts against fortified positions. Next year, we intend to have a similar schedule with six preliminary rounds on Wednesday and Thursday advancing four to the semi-finals to give players as much flexibility as possible with other events. We are looking at changing some of the scenarios played. Any recommendations are welcome. Some of this depends on if anything is published this year by MMP. The training session on Wednesday for new commanders prior to the tournament will certainly continue as we have gained many newcomers over the past few years. 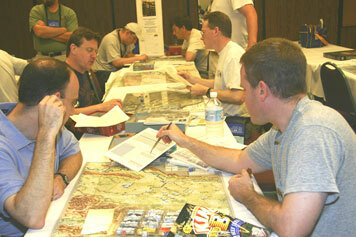 During the week, Ed had on display a draft map and scenarios set up for the area around Chattanooga, TN. Hopefully we will see a product nearing completion for the Western Theater next year. Talking with Ed, we think that it is a real longshot that it would be published before WBC. And even if it was, without most players having seen any of the scenarios, it would probably not be fair to include it in the tournament. Perhaps though, we will have the ability to have some demo games or a campaign. I must especially thank Ed Beach this year who started off the tournament for me Wednesday morning. I had a work crisis come up on Tuesday just as I was ready to leave which required me to go into the Pentagon for several hours Wednesday morning (I would have probably had to return to DC if I had made it to Lancaster on Tuesday).